Mitsubishi is today boasting of a double whammy when it comes to its new electric car. It not only will be cheaper to buy, but it will cost less in electricity to run than its major competitors. The i, Mitsubishi Motor's all-electric vehicle, has garnered an EPA-rated 126 MPGe (that's gas-mileage equivalency, meaning how its electricity use would compare if it ran on gasoline) for city driving and 99 MPGe for highway driving. These numbers compare to Chevrolet Volt's 95 city/90 highway when running on electricity alone without its gas engine, or the all-electric Nissan Leaf's 106 city/92 highway. "It means our electric drive train is more efficient. We will cost you less to operate," says Mitsubishi spokesman Moe Durand. "It will make the best use of its electricity." But bear in mind, the i is a subcompact. The other two are considered larger, or compacts. As such, Durand says it may not be entirely fair to compare i to Leaf and Volt. The new i, won't have the best range on a single charge. 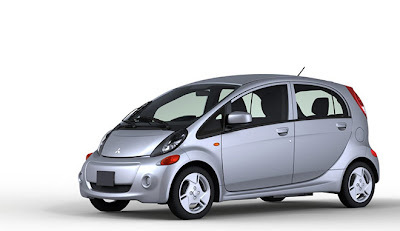 Mitsubishi says it will have a range of 62 miles before the battery needs to be recharged. The Leaf, by contrast, is rated at 73. The Volt only goes 35 miles on electricity alone, but the backup gas engine means there's no danger of being stranded without juice. It will start at $27,990 for the base model before shipping charges are added. That's about $5,000 less than a Leaf and $13,000 less than a Volt. "We feel that with the combination of capability, affordability, and high level of efficiency offered by the 2012 Mitsubishi i will prove very appealing to consumers considering EV transportation," says Yoichi Yokozawa, CEO of Mitsubishi Motors North America. The i is now available for pre-order, arriving early in 2012.